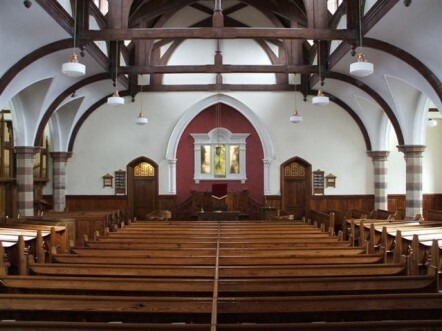 The earliest record of a Presbyterian church in Omagh is in 1667 when a Rev. Samuel Halliday was installed. A native of Scotland, Rev. Halliday had served in Connaught before coming to Omagh. He fled to Scotland at the time of the Revolution of 1688 and, for almost ten years thereafter, the congregation was vacant. Rev James Maxwell was eventually ordained in November 1699, with a stipend of £40.00 per annum plus forty barrels of oats. In 1750 he died in charge after a long ministry. The “new” church on the Dublin Road was built during his ministry in 1721 and it was used until the opening of the present building in 1897. The 1721 church building has been restored and erected in the Ulster Folk and Transport Museum, Cultra. The third minister was Rev. Hugh Delap form Ramelton who was ordained and installed in 1751. His election was not unanimous and a number of families left to form Second Omagh, now know as Trinity. Following his death in 1787, he was replaced by his son, also Hugh who, unfortunately, was degraded from the ministry in 1805. The second Rev. Hugh Delap was succeeded, in 1806, by Rev Samuel Cuthbertson. In 1834, following an investigation by the Synod, he was required to retire. His replacement was Rev. John Arnold of Clontibret. During his ministry, renovations were made to the church building which was officially reopened in 1862. Mr. Arnold retired because of ill health in 1875. At that time the manse, at Kevlin, just outside the town was burned down and all the church records destroyed. Rev. James Maconaghie came to Omagh from Second Castleblayney in 1875 to be assistant to Rev. Arnold whose health was failing. After a ministry of eleven years he was called to Fortwilliam Park in Belfast. His successor was Rev. William Colquhoun from First Ahoghill who was minister in First Omagh from 1886 to 1893. First Omagh’s ninth minister was to be Rev. Andrew Macafee from Richhill who was installed in April 1893. It was during his term as minister of First Omagh that the present church was built. In April 1925 it was announced that Mr. Macafee would retire in July because of ill health. During his ministry he had overseen the building of the new church and halls and of the sexton’s house. His successor was Rev. W. N. Maxwell from Dervock who served in Omagh from 1926 to 1930 when he went to Woodvale, Belfast. Three months later, the installation of Rev. Thomas Alexander Byers (TAB) Smyth of Belfast took place. It was at this time that it was decided to divide the congregation into districts and that Mr. Smyth would be accompanied by a member of committee on his initial visit. He married the following year and, in 1939, he moved to Great Victoria Street church in Belfast. He would subsequently serve as Moderator of the General Assembly. A native of Dunmurry, Rev. A. M. Jack, came to First Omagh from Watford Presbyterian Church in England. However, his was to be a ministry shortened by his desire to undertake special wartime work in Southampton and he left in September 1940. From Second Islandmagee church in April 1941 came Rev. Samuel Gilmore. Once again, ill health took its toll and Mr. Gilmore resigned in 1948. In March 1949, a unanimous call was given to Rev. A.E.C. Rowan from Donegal. This was to be another long ministry during which he was presented with a car from the congregation in 1970 to mark twenty one years in First Omagh. This ended the familiar sight of Rev. Rowan on his bicycle! He died in service in December 1973 aged 57. In June 1974 a congregational meeting elected Rev. John Finch Murdoch, a native of Bangor and assistant in Knock congregation. He was installed in September 1974 and retired in February 2011 after a continuous ministry of over thirty six years.